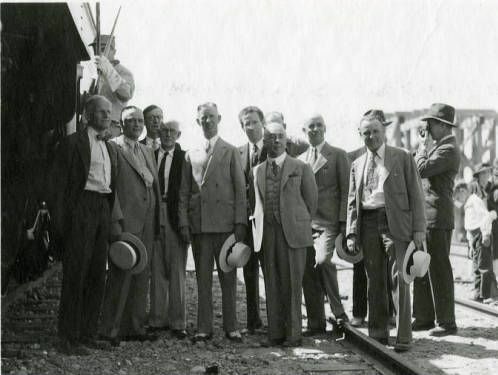 Part of the official party at the opening of the U.S. Construction Railroad celebration on July 29, 1935. L-R: Governor Clarence Martin, locomotive engineer; Mr. Francis Donaldson, Chief Engineer, M.W.A.K Company; Mr. J.I. Dinman, President Spokane Chamber of Commerce; Mr. James O' Sullivan, Columbia Basin Commission; Mr. E.F. Blaine "Father of Irrigation;" Guy F. Atkinson, Vice President, M.W.A.K. Company; Ben H. Kizer, Chairman, State Planning Commission; William Clapp, Attorney, Ephrata; E.L. Kier, Vice President, M.W.A.K. Company; Harvey Slocum, General Superintendent, M.W.A.K. Company.